AutoTURN Pro, the intelligent swept path analysis solution, utilizes automation and 3D capability to enable the modeling of multiple vehicles in complex environments. AutoTURN Pro is perfect for projects with potential terrain and overhead conflicts such as rail crossing, bridges and tunnels. 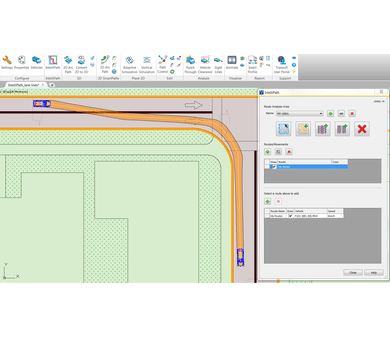 AutoTURN Pro, the intelligent swept path analysis solution, has all the great functionality of AutoTURN plus advanced automation and 3D capabilities. Even if your designs work in 2D, make sure they pass a 3D check. 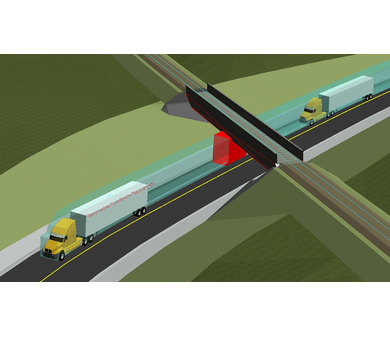 Our unique 3D technology highlights potential conflicts between vehicles and terrain or overhead obstructions. You can instantly see where you may need to adjust your design. The analysis considers yaw, pitch and roll, overhead conflicts, and vertical curve conflicts that may be unforeseen or unapparent.